Eggnog and wine; Christmas cookies and candies; and just too, too much fun can leave your belly uncomfortable and bloated. Tea, baking soda and vinegar can rescue your digestion and your waistline. Digestive Teas –The warmth of hot tea is comforting in the winter season and these herbal teas bring a cozy feeling to an over-worked belly. Ginger tea stimulates digestion by increasing blood flow to relive that sluggish feeling. Ginger works throughout the digestive tract to activate digestion and prevent the formation of gas. Peppermint tea stimulates bile flow which works to digest fats. Fats slow digestive action. Too much brie cheese can slow digestion to a near standstill. Chamomile and licorice root teas calm the digestive tract. Sit down, put your feet up, sip your tea and fully relax your belly for optimal digestion. Chai tea is made from ginger, cinnamon, cardamon and pepper all of which aid in various aspects of digestion and absorption. These spices added to black tea and milk are effective and delicious. Apple Cider Vinegar – is a tried and true kitchen remedy to increase the stomach acid required to breakdown foods and prepare nutrients for absorption. 1-3 teaspoons in a glass of water taken 15-20 minutes before a meal increases the production of HCL. Only 50% of those with symptoms of acid-reflux or GERD actually have too much stomach acid. The other 50% have too little stomach acid causing poorly digestion food to ferment generating a reflux of fermentation acid – not stomach acid. Apple cider vinegar is an easy antidote for the 50% with too little stomach acid while baking soda handles the symptoms of too much stomach acid. 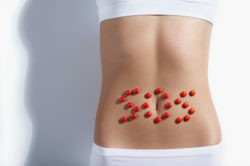 Baking Soda – 1-2 teaspoons dissolved in about 4 ounces of warm water can neutralize the unpleasant symptoms produced by too much stomach acid. Evening Constitutionals – once a way of life in earlier centuries. Men and women took a mild walk after the evening meal to aid digestion and discuss world affairs. Bring back the evening constitutional to unwind from the day while aiding digestion. Gentle physical movement aids digestion while focusing thoughts on the day’s blessings reframes your mood for restful sleep. OverEater’s Tonic is a great antidote for over-indulging during the holidays. This tonic combines several digestive aids to sooth the belly. Epicurious is one of my favorite sites for menus and recipe ideas. This month Epicurious published a recipe for the Overeaters Tonic. Click for the Overeater’s Tonic recipe.